There are 2 types of receipt – Standard or Sundry. 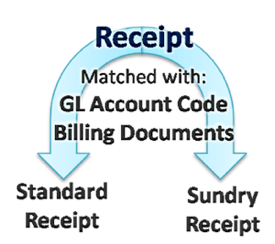 Similar to Payment Voucher, a Standard Receipt requires an Account Code whereas a Sundry Receipt does not require an Account Code. In the Receipts page, click on New button or Ctrl+N. Fill in the Narration. This is the text that will appear in the Receipt and Monthly Statement, which is visible to the Customer. Remarks is optional and for internal reference only. Click Add Documents… in the Misc menu. If you are creating a Sundry Receipt, just type in the Name, which is the textbox beside the Account lookup. Once selected, a list of outstanding documents will appear in the list below. If there are no documents listed, means that there are no outstanding for the contact or the documents (such as invoices) are not yet posted. To match a document without typing, you may double click on the outstanding document to apply the amount. The Advance Receipt (also known as Advance Payment from Customer) is a scenario where the customer paid in advanced, before an invoice is created. Click the Misc menu and select the ‘ADD GL’ item. Fill in the other information detail such as payment mode and amount paid, and cash code. Save and POST the document to reflect in the report such as Debtor Statement / Ageing. When the respected bills / invoice have been created. Select the Journal menu and create a new transaction. Select the Customer from Trade Debtor list which contains the related invoice. Click the Misc menu and select the ‘ADD SUNDRY’ item again. Select the Account GL Codes that you have selected in the 1st scenario. example: Debtor Control Account. Match off both transactions with their respected amount. SAVE and POST the document to reflect in the report. The Debtor Ageing / Statement should show that the amount is balanced out and cleared. The Over Payment can be split into 2 scenarios. An existing invoice is required to be matched in the receipt. You must make sure both Paid & Applied amount are the same (more than invoice). Once the Receipt is Posted, the Debtor Ageing & Statement will show the over amount in report. From the Posted receipt above, create another Journal to transfer the balance into desired Account Code such as Sales or Debtor Control Account. Dear Sir, I have downloaded and installed the appicaton of ProLine Lite 3.0 but when I click the icon, it appearing message like this : “colud not find C/DatumClear Mind/ProLine/ProLine.lic”. If this mean license, I have already received form you this morning , but how can I insert the free license to this applicatin. tks. Hi elias, just wondering whether you still have the same problem? FYI, you will need internet access when running ProLine for the first time to download the license automatically.